Jessie Rennie’s grand experiment fusing science fiction and philosophy moves boldly into its second phase, and the resulting reaction – if not exactly stellar in its synthesis, or nuclear in its power, is still good enough to spark off a few neurons. Only a few neurons, because the bulk of these tales seem to end right when they get really interesting (“Ghosts”, “Terra in Vista”), or raise intriguing questions without exploring them in depth (“On The Spiritual Plain”). Others, like “The First Step” (about a future transhumanist dictator seeking to establish a cybernetic Nirvana for his followers) have epic ideas but come across as a little heavy-handed. What some of the individual selections lack in subtlety they make up for in cohesion. Sometimes in an anthology a single theme is curated by the editor, while other times – in a case of cosmic synchronicity – the disparate authors happen to share the same muse and write about similar subjects. At any rate, many of the stories and essays in the Sci Phi Journal #2 deal with illusory worlds and false perceptions, feature the horrors and wonders of transhumanism, and ultimately champion an unaugmented red pill reality. By that standard, the articles were the most successful for me. Tom Simon’s “The Making of the Fellowship: Concepts of the Good in the Lord of the Rings” artfully breaks down the vices and virtues of the various races of Middle Earth, while John C. Wright’s “Prophetic & Apotropaic Science Fiction” humorously dissects the (often failed) prophecies and predictions of sci-fi while establishing the difference between the two concepts. Science fiction and philosophy are natural bedfellows and intellectual kin-cousins, so I expect more of their freakishly smart offspring in the third edition. I’m behind and have only purchased the first edition. The magazine seems to have a lot of promise, if not a few kinks to smooth out. I think I will keep purchasing just to watch it develop. Add to New release list. 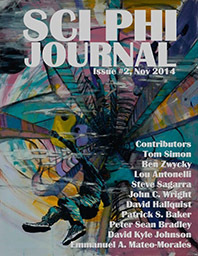 Since I don’t see a link in the article… Sci Phi Journal #2. Also, I seem to not be getting New Release mail anymore, so, adding to that. I enjoyed it, definitely, though the first was perhaps a bit better. “Ghosts” seemed a bit heavy-handed to me early on but I really loved that final image of the people dancing and talking with nobody, looking insane to those who had eyes to see. I enjoyed “On the Spiritual Plain” quite a bit, actually. The articles were excellent. Simon’s “Fellowship” article was pretty good. Yeah, Ghosts has a great ending that mostly justifies the casual and ambling narrative that precedes it. Once I sat down to read them I could not stop till I was done! I will keep reading them as long as Jason keeps producing them. Thank you for the kind words, to be placed on the same level as Mr Hallquist’s powerful tale is praise indeed. I purchased The Book of Feasts during the introductory period and was supposed to get a code to get a free copy of a book and chose this one. I never received it and never got a response from Castalia House when I sent emails about it. Just sent you an email. Sorry, but we never got your emails, We’ll be happy to send it out to you now. EPUB or MOBI? EPUB works for me. Thank you very much. I received your email with the ebook. I really appreciate you sending it.